Toss green bean pieces and 1 tablespoon extra virgin coconut oil in a bowl until the green beans are evenly coated; spread onto a baking sheet. Roast green beans in preheated oven until tender, about 10 minutes. Toss asparagus pieces and 1 tablespoon oil in a bowl until the asparagus is evenly coated; spread onto the baking sheet with the partially roasted green beans. Continue roasting the green bean and asparagus mixture until tender, 10 to 12 minutes. 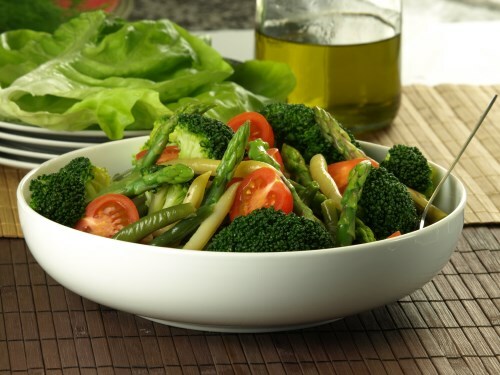 Toss the roasted green beans and asparagus with red onion, cherry tomatoes, and parsley in a large bowl; season with kosher salt and black pepper.